"So no matter what I'm doing, there's something I'm not doing. "...Crescent Dragonwagon, on guilt. When you do a garden well, it seems like there are two choices. You either spend all your waking hours, canning, drying, freezing and eating the excess, or you turn your head the other way and feel guilty at not using the bounty completely. Our long time Ozarks-now-Vermont friend, Crescent, described such guilt well on her blog. She and her partner, David, planted and grew, heads of cauliflower, described how they were eating a head a night, roasted. I wish I liked cauliflower, or even broccoli. Those are full of amazing anti-oxidents, I'm told, preventing cancer and keeping the earth from shaking and the sky from falling. It's in my genes, I think, not liking cauliflower. You probably can't grow up eating cauliflower that's cooked to baby teething softness, drenched in Velveta cheese, and then later in life learn to love cauliflower that's slathered with good olive oil and broiled. 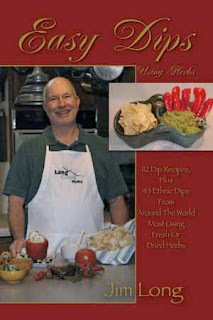 Raw, it's fine, dipped in a homemade dipping sauce, maybe one from my favorite Easy Dips Using Herbs book. It's not too bad in soup, given enough flavors to give it some flavor. Give me a head of savoy cabbage anytime. Grill an eggplant with some olive oil. I like almost every vegetable I've encountered in one lifetime, broccoli and cauliflower just aren't on the list, unfortunately. Our savoy crop this year has been outstanding. Rich, buttery, crinkled heads of the sweetest cabbage. Josh wanted to make kraut and I opined that using savoy cabbage for kraut is like spreading caviar on a peanut butter sandwich. But, since guilt had taken hold with cabbage about to go to waste (one can only eat so much coleslaw and summer salad) several severed and savoyed heads went under the kraut hammer this week and either into jars or into a crock, I didn't watch which. The big news, for anyone who cares one bit about plants, is a new acquisition in the garden when Drs. Art and Sherry Tucker and friends from Australia were here. Art brought an Aeollanthus suaveolens, a fantastically coconut scented plant from Africa that now resides in the middle of the garden under an umbrella. Why, you might ask? Because newly planted plants, especially those having traveled by car across half the United States, have become pale and in need of a bit of protection. But doesn't this plant have a common name, you are probably wondering? Unfortunately, no. I think we will have to name it. Maybe just, "Art's Coco-nutty." I read that Aeollanthus is used in voodoo rituals in Brazil, some kind of body washing ceremony, which is probably pleasant considering it's luscious aroma. 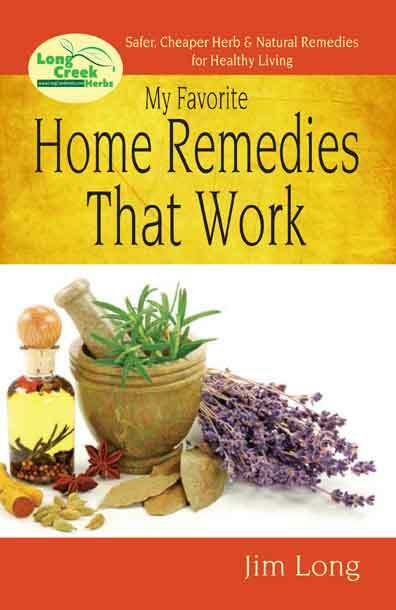 It's used medicinally in Africa, it's home, and in fragrance and culinary processes, too. Some people say it reminds them of the beach, I think because it smells like Tropicana suntan lotion, only better. Very pleasant, and the fragrance lingers on your fingers for several minutes. We'll have to try it in a dream pillow and see if it evokes beachside dreams. I enjoyed watching Hillary's speech at the Demo. Convention. She's good and thinks fast on her feet. The first time I met her, many, many years ago (1985, to be exact), she was holding up the lavender wand I had made for her, the first lavender grown at the Ozarks Folk Center's new Heritage Herb Garden. I'd designed and created the garden for the State of Arkansas - a garden that has evolved much differently than imagined and has a delightful life of its own now. Hillary Clinton was there to dedicate the Garden, and after I presented her with the first lavender wand from the garden, she held it up and gave a two minute off the cuff promotion of my work and my lavender wands. It came at a very fortuitous time for me. I'd had a back injury while working on the herb garden, had no medical insurance and could not work due to the injury. (She knew none of this, however). Her simple off the cuff remarks in front of a hundred or so people and news media, sold a lot of lavender wands for me that year, contributing to the pitiful little income I had. Then in 1988, when Bill Clinton dropped out of the race for the White House, I sent another lavender wand to Hillary, this time with lavender made from my garden and including a quartz crystal from Hot Springs, AR. That wand was 18 inches long due to an exceptional lavender crop that year. In the presentation box I'd had made, I included a humorous note about how lavender has always been an enchanting and magical plant, and how some people believe that crystals have energy. In that note, I said I was sorry Bill had dropped out of the Presidential race, but if he chose to try again in 1992, to keep the lavender wand and it might give just enough boost of energy to put him over the top. And, quite remarkably for me, I was sitting in Washington, D.C. in January of 1993, in town f the Inauguration, watching ABC news coverage of Bill and Hillary as they packed up to move out of the Arkansas Governor's Mansion. They had lived in that same public building for something like 16 years and were describing what was to be disposed of, and what was to goor with them. 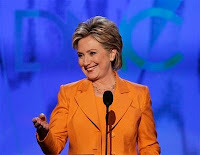 It was an enormous thrill for me, when Hillary pointed to a stack of memoribilia that "must go with them". The top of the stack included a basket from the Ozarks Folk Center, with my lavender wand in the very top. 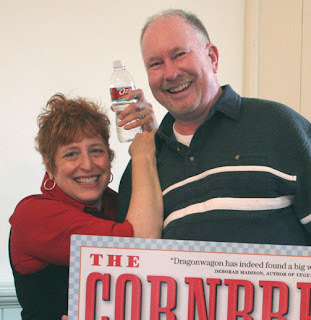 That trip, with Crescent and Ned, along with a whole crew of folks from the Dairy Hollow House in Eureka Springs, AR, and including Mr. & Mrs. Workman, the publishers at Workman Publishing in New York, was to create an Inaugural Day Brunch for the Clintons. So it was with great pride that I watched Hillary's unifying speech tonight. I feel privileged to have known her and seen up close what a dedicated public servant she is and felt like that was a friend delivering that speech. 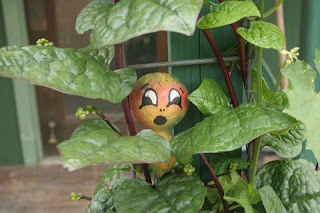 Even the Gourd People (left) are surprised at the continuing rains. This one's hiding in the malabar vining spinach, which is listed as edible, but has more oxalic acid than its all-green Asian cousin, which is the better tasting. Malabar spinach is from Africa, loves summer heat and thrives in dry conditions and produces leaves to cook all summer long. 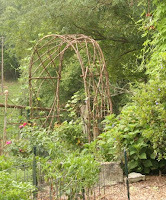 The two kinds cover an 8 ft. high arbor in the middle of the garden. On the subject of arbors, Adam built several bentwood trellises out of native cedar, along with this very handsome arbor in mid-summer. It's already covered with Indian snake gourds and morning glories, which the goats have been standing up on their hind legs to nibble on. 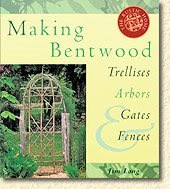 He has the trellises installed in the garden with beans growing on one, passion vine on another and morning glories on the third. Here's what the garden looks like this week. We have a bounty of beans - 8 or 10 varieties of climbing beans and several bush types. I'll post photos of some soon as they have quite attractive flowers. 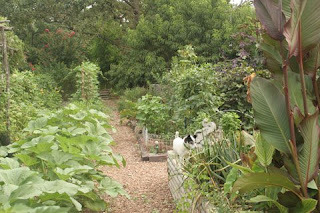 The garden is a bit jungly, as the constant rains all season have causes everything to over grow their beds. The photo to the left was taken in early morning with a bit of light fog. 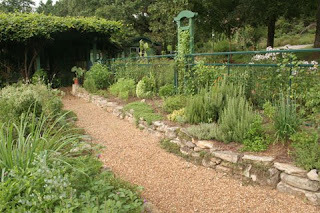 And below, right is part of the culinary beds and pathway that leads to the Herb Shop. Visitors to the garden this week and last have expressed surprise at the extremely sweet stevia plants, and the great numbers of butterflies in the garden. We saw the very first Monarch butterfly today, a harbinger of fall weather to come. The red and white cucumbers are really producing rapidly, lots of Brandywine tomatoes and the Egyptian malokia is ready to start harvesting for greens. (Pictured here are Rex and Carmel, Art and Sherry and our summer intern, Adam...who we've dubbed Papalo Picasso, since his budding interest in the herb, papalo and his degree and talent in art). We were very pleased to have Drs. Art & Sherry Tucker from Delaware. They brought with them Carmel and Rex from Australia, who are commercial lavender growers. Rex said they grow 10,000 lavender plants in their fields, harvesting them by hand and running the lavender through the threshers and selling the flowers. Art Tucker is a long time friend and Research Professor, and co-director of the Claude E. Phillips Herbarium at the Dept. of Agriculture and Natural Sciences at Delaware State University. He's the author of 2000. Herbs of Commerce, co-author of The Big Book of Herbs (with Tom Debaggio), and many, many, many more writings. We know him as the walking encyclopedia of herbs and the foremost authority of fragrance oils in herbs. One of the plants in our garden, which we dubbed, "Art Tucker's Russian sage," is a white clary sage we look forward to seeing bloom in the garden each year, and which the goldfinches also anticipate because of the abundance of seed the plants produce. Carmel is the editor of Lavender Australia magazine and we had previously only met by email as she had invited me to write articles for the magazine. 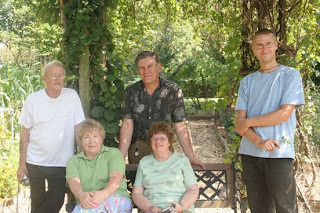 Now we have an invitation to go to Australia and visit these delightful folks and see how commercial lavender is grown. It was great fun having serious plant people here and feeding them some of our garden produce. Even more fun were the walks in the garden, learning new things and trading information and plants. It was a great reminder to me of why it is I love to garden. Not just the plants, but the people and the food that we get from all the herbs and vegetables. What a treat for us to have such wonderful visitors.